If you're an AC/DC fan in either New York City or Los Angeles, and you also happen to be enamored with big modes of transportation, the next few days will be sheer bliss. Beginning today (October 16), fully tricked-out Black Ice interactive trucks - easy to spot, as they'll have the distinctive AC/DC logo - will roam the east and west coast cities, stopping in various locations, and blasting the new AC/DC album for all to hear. 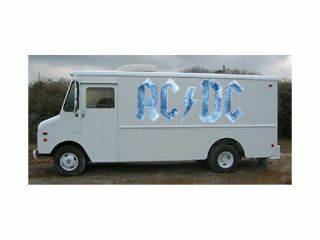 And there's more: On Sunday, the trucks will become AC/DC "pop-up" stores, allowing fans to purchase physical copies of Black Ice before it's on sale anywhere else. For a complete list of dates and locations to find Black Ice trucks in New York City and Los Angeles, visit the AC/DC website.